We have four kids, and though I love them all fiercely, the sheer number of them presents some difficulties. We can’t all fit into a sedan, regular sized booth at a restaurant, or a single canoe. Finding a babysitter for date night is pretty expensive. Keeping up with all of the laundry is practically impossible. 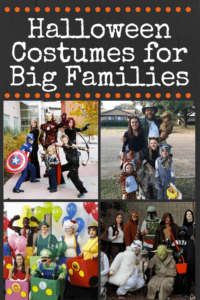 This post, Halloween Costumes for Big Families, contains affiliate links for your convenience. This means that if you click on a link and make a purchase, I’ll receive a compensation. Read our full disclosure policy. But one thing that shouldn’t be a problem is finding Halloween costumes that all go together. 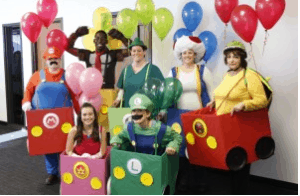 Sure, I could just let everyone pick out their own costume and not match, but where’s the fun challenge control in that? And yes, we dress up for Halloween. It is actually my husband’s favorite holiday. But before you brand us pagans and start decorating for your fall festival, read this article about how Halloween is actually a Christian based holiday and fall festivals aren’t. Now, back to the costume dilemma. I know we aren’t the only big family that struggles to find group costumes. I see tons of cute ideas for families with two kids, but very few for us bigger families. So I’ve done a round up of some really cute ideas for larger families. Most of these could be modified for smaller families, too. I also tried to pick ideas that you could potentially DIY most of the parts. Obviously, going to a costume store and picking up a new costume for everyone would be easiest, but where’s the fun/money saving/stress in that? This is a great one because it is fairly easy, and you can make it as big as you need. Just have one person dress up as a zoo keeper and everyone else is an animal! This is our family picture from last year. 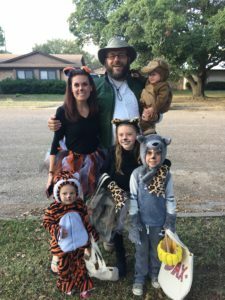 Our initial plan was for me to be the zoo keeper because that’s much more true to life, but it was going to be like $100 to rent a gorilla costume for my husband. So instead, I made him a name tag and bought him this nerdy hat that he now totally loves. The tiger and monkey costume were hand-me-downs from the older kids. They were bought back in the days when Old Navy made great costumes, and then put them on sale for $10. My daughter and I made our tulle skirts, using this tutorial from SimplyRealMoms.com. We bought our ears, tails, and paws at Target. We decided to forgo the full costumes for the older kids because they were much more expensive than just hats, headbands, gloves, and tails. The unexpected benefit of that decision is that they play with those pieces all the time. Recently, the older three wore tails to the grocery store. Since I’m trying to be a more fun/less controlling mom, I let them. But I got about five times more “Enjoy those kids! !” than a typical two cartful grocery trip. With so many great Star Wars characters, it would be easy to pick a few for your family. And unless your husband is like mine, it won’t even matter about the characters existing in different times. Yes dear, I know that Yoda was dead before Kylo Ren was born. Most of the costumes can be DIY pretty easily, but there are a few pieces that purchasing would just be easier. 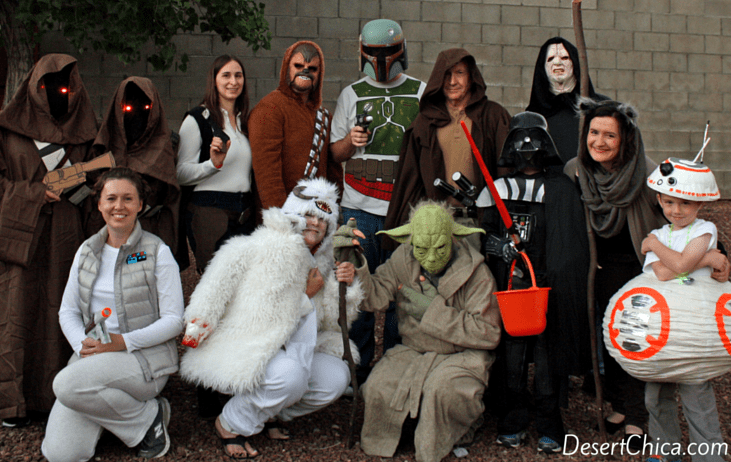 Karen at DesertChica.com (pictured above with her crew) has some great tutorials for making your own Star Wars costumes. You can check those out here. This one is a classic for a reason. I love how many people you can work into the same theme! I also love how easily recognizable it is. I’m a huge fan of costumes that are puns or clever, but sometimes I get tired of explaining what we are supposed to be. Ya’ll, this is so adorable! And it really doesn’t look THAT hard? Besides the saving of boxes for a couple months. Just kidding. I order all our stuff from Amazon Prime because it’s free shipping and running to the store with four kids is hard and sometimes embarrassing (see tail story above). We could collect that many boxes in a week. The only thing I think you’d need to buy are the hats. Everything else seems like it would be very DIY. Depending on where you look, the options for members of the Avenger Squad are numerous providing plenty of options. You would need some masks and props, which you might already own if you have kids. And most of the other pieces could definitely be made. 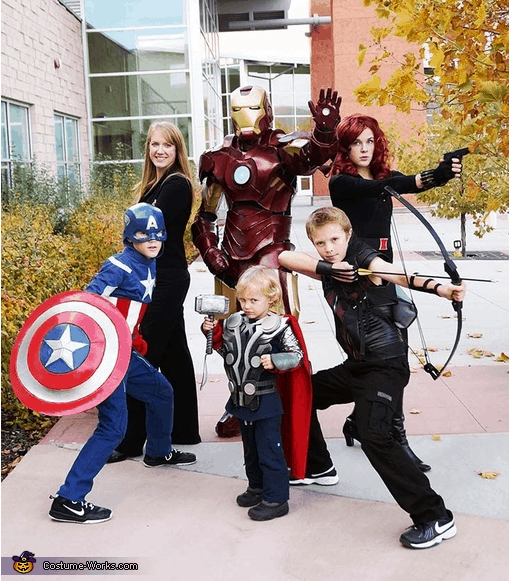 Yes, it’s more work to coordinate a family costume theme than to just let everyone wear whatever they want. But I feel like we are going in different directions for so much of our day that coming together over something like our Halloween costumes is good for us. The kids enjoy brainstorming ideas for months and I love their confidence in our ability to make things. They are infinitely creative and optimistic. I want to teach them that family is first. 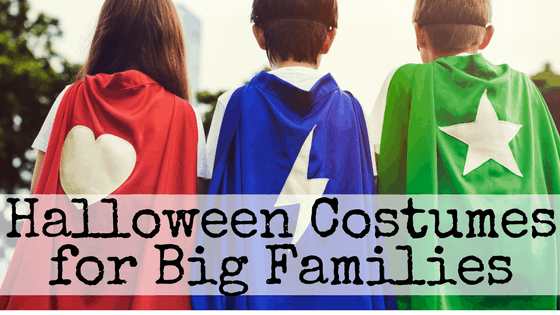 And while I don’t think our Halloween costumes are going to single-handedly change their mindset, I do believe we are deliberately creating a culture of togetherness in our home. 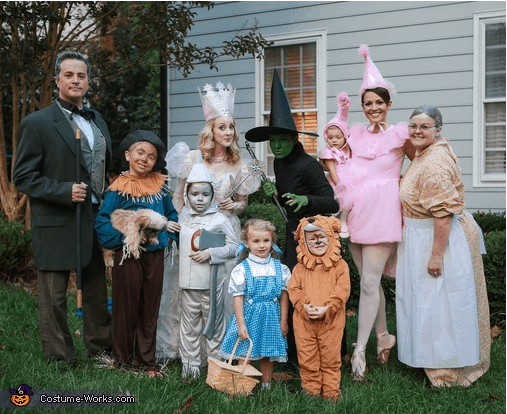 Do you have any suggestions for Halloween costumes for big families?